Nervous? Sweaty palms? The new site is launching soon. What if everything goes wrong? What if you lose your rankings in Google?? Relaunching a high-ranking website is scary. Just imagine: hundreds of hours of work, thousands of dollars invested and then… lower traffic, fewer leads, lower sales. If your website ranks high and gets traffic from search engines, you may be terrified to redesign. You shouldn’t be. As long as you follow best practices, you should expect to maintain or even improve your rankings. Maintaining your rankings is all about making sure that all of your high-ranking pages have a new home on your new site, and that search engines can find them. This does not mean you have to move every page. That’s right. You do not need to move every page to keep your SEO rankings. Many of your current pages don’t rank, get no traffic and have no SEO value. So moving them (or not) has no impact on SEO traffic whatsoever. These are the pages that are linked to from other websites. These are the pages that currently rank AND get traffic. First, let’s take a few seconds and measure the general size and shape of your current site. This search shows the number of your pages indexed by Google, which is the general size of your site. It puts you in the ballpark and it only takes a second. 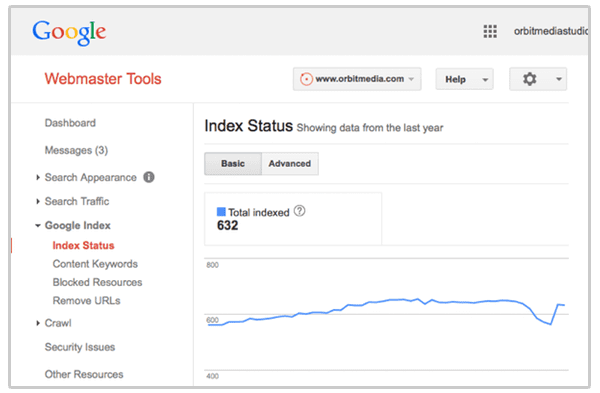 A more accurate page count is the Google Index > Index Status report in Google Search Console (formerly Google Webmaster Tools). We’ll come back to this tool later. Now that we can see the general scale of things, we can make some big decisions about what and how much to move to the new site. If your site has dozens or hundreds of pages, it makes sense to move all the pages to the new site, especially if your new site uses the same CMS as the old site. The migration may be simple. If you have thousands of pages or if the process of moving things involves any manual work, prioritize the pages so you’re not doing useless work. Follow the rest of the steps in this process. Next, let’s get a list of all the pages so we can preserve the SEO value and keep the pages that matter. If you want to create a list of all the URLs on your website so you can consider the SEO rank and traffic of every possible page, there are a few ways to do it. There are many tools that “crawl” websites, creating a list of pages that should potentially be carried over to the new site. Some of these are free (Xenu Link Sleuth) and some are paid (Screaming Frog). But these tools often show false positives, or URLs that aren’t pages at all. For example, if you find a “page” called www.webaddress.com/blogtag, ask yourself: is this a page of content or just a leftover URL created by the CMS? Use common sense and remove anything that’s not an actual page. You can also skip the crawl tools and go straight to Google Analytics. The pages you find here are the pages that matter. These are the ones that get traffic, so they’re likely the ones that rank. And if Analytics is setup properly, you won’t miss a thing. 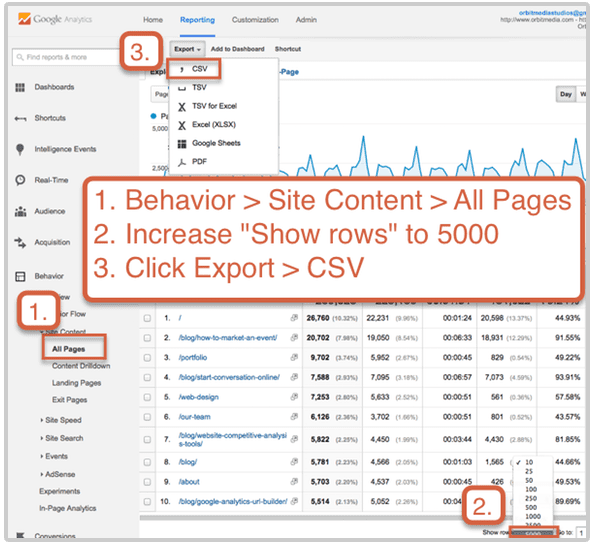 Here’s how to export a list of your pages from Google Analytics. …and you’ll download 10000 records instead of 5000. Sneaky, right? Now you have a list of all of your pages according to Analytics. But really, most of these have no traffic and no SEO value. So let’s narrow down our list and focus on just those pages that matter. There are a two places to find the pages that are already ranking. Really, these tools don’t find pages, they find phrases. So it’s up to you to connect the dots and find the corresponding page for each phrase. But usually, it’s obvious. The free version will show you the top ten phrases you rank for. But you’ll need a paid subscription (or free trial) to see the rest. This is an excellent tool and I recommend the paid version for serious SEOs. You’ll probably notice a few things in these reports. 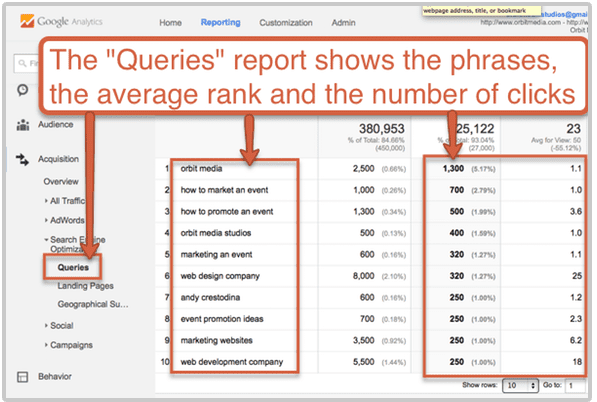 A small number of phrases (and pages) accounts for a huge percentage of search engine traffic. This is why it’s important to prioritize. Your brand or company appears in these reports. Just ignore it. Pretty much everyone ranks for their name. SEO is about getting traffic from non-branded keyphrases. You rank for some really random, obscure phrases. You can ignore those too. Warning: Even if a page gets traffic from SEO, that traffic may not be worth anything at all. Most sites have pages that rank for irrelevant phrases, attracting visitors who will never convert into leads or customers. Losing SEO traffic for these pages and phrases costs you nothing. To measure the actual value of the traffic from these phrases, look up the conversion rate from a visitor into a subscriber or lead. Check out the Behavior > Site Content > Landing Pages in Google Analytics. If the conversion rate is lower than one tenth of one percent, losing traffic to this page isn’t going to hurt a bit. If the page doesn’t meet either of these criteria, then getting rid of it when you launch the new site won’t actually affect your business …unless the page is providing you with another, more indirect benefit: generating authority. Next, let’s find the pages that have incoming links and make your website more authoritative in general. So finding and redirecting the pages with incoming links is important. It’s good for SEO. It’s also good for referral traffic since you don’t want your website’s relaunch to break links around the internet. The Search Traffic > Linked to your Site reports lists all the pages on your site that have been linked to from other websites. The “Top Pages” report within the MOZ Link Explorer goes one step farther than just counting the links. 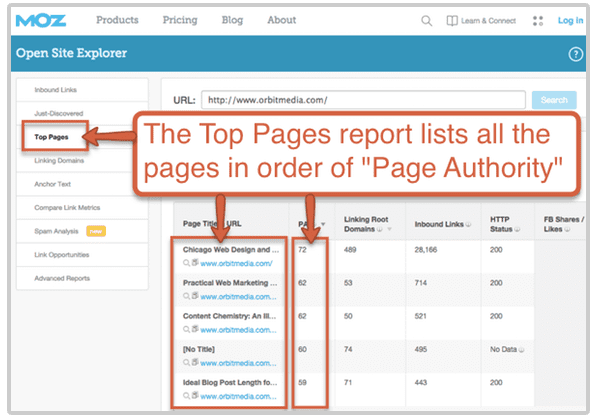 It estimates the value of each link and then ranks all the pages on your site, from most authoritative to least (of course, the home page is always the page with the most authority). The free version only shows the top five pages, so it’s not very useful. The paid version includes all the data. This is an excellent tool and I recommend the paid version for serious SEOs. Now that you know which pages are already ranking, getting traffic or have incoming links, you know which pages are most important to redirect to maintain your SEO results. Add these as priority pages to your list! Step #5: Don’t Just Migrate Content, Upgrade It! It’s easy (and lazy) to just move the old pages to the new site. Think of the relaunch as an opportunity to upgrade the content. If a page was ranking for a phrase, make the new version of the page indicate relevance for the phrase even more. 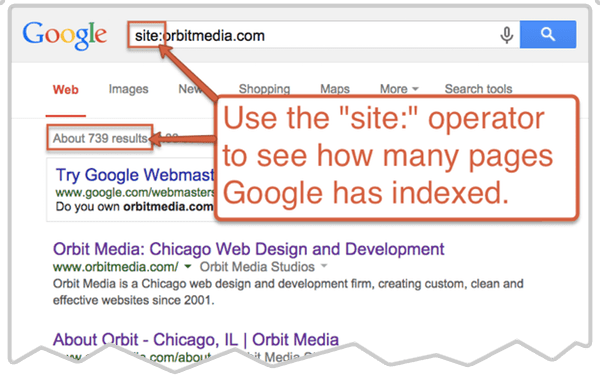 See the On-Page SEO Checklist for details. Add more detail, explanation and examples. Remember, search engines like long-form content. The average high-ranking page is 1,500 words long. Add video. The length of time visitors spend on a page correlates with high ranking. And video is a great way to get them to stick around. Add images. Pages with images are more likely to get shared, and sharing is one aspect of social media that correlates with higher rankings. Learn more about how social media affects SEO. 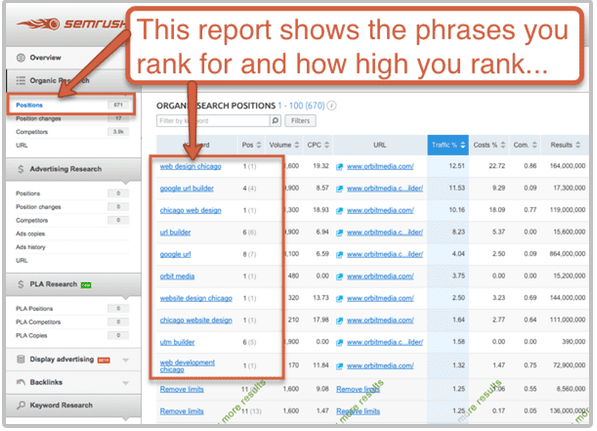 Each of these little actions is a way to improve your rankings, not just maintain them. If you move to a new house or apartment, you fill out a change-of-address form at the post office. If a page moves from one URL to another, you create a 301 redirect. A 301 redirect is tiny piece of code that tells a web browser or search engine that there is a permanent new location of a page. That’s it. When a search engine sees this, it updates its index to include the new address. It also passes (some of) the link value to the new address. Proper creation of 301 redirects is the key to preserving search engine rankings during a website redesign. Go back to your list of important URLs from the current site. Now in a second column, add the corresponding URL on the new site. Prior to launch, you need to create a 301 redirect from the URLs on column A to the URLs on column B. If there isn’t a perfect 1-to-1 correlation of pages on the old site to pages on the new site, just do your best to find the closest page and go with it. Don’t overthink it. Example: You might have had one big team page on the old site, but the new site will have a page for each team member. No problem. Just have the old team page redirect to the main team page or the about us page. Good enough! Redirects can be created in several places. And where you put them matters. A lot. Warning: Do not use the htaccess file to create lots of redirects. Although you can use the htaccess file to create redirects, you’ll kill your website’s load time. Add enough 301s here and you’ll add full seconds to the loading time for every visitor. A slow website can hurt rankings and discourage repeat visits. Here are some guidelines on how many 301 redirects you can put in an htaccess file. 100-1000 redirects in your htaccess and you’ll crash your site! The htaccess file is for simple redirects, such as redirecting http://website.com to http://www.website.com. To redirect large sets of pages, use the tools built into your CMS. Share this post with your developer if this is unclear. ProTip! Redirects don’t need to stay there forever. After 180 days or so, Google will have found the new pages and you can remove the redirects. It’s especially good to remove them if you have them in your htaccess file since this will speed up your site. A link from another website to you passes authority and SEO value. But a 301 redirect diminishes some of this value. In other words, it’s better to have someone’s website link to an actual page on your site, rather than link to an old URL that redirects to a page on your site. So whenever possible, find the links to your site (which you did back in step four) and ask yourself if you can reach out to any of the editors at any of those websites. Ideally, you can send a friendly request and a few of these editors can go into those pages and update the links, pointing them to the new address on the new site. This makes the redirects unnecessary and preserves more of your authority. Next, let’s address a few of the technical issues that always go with relaunching website. Every website should have a little file that tells search engines how it likes to be treated. The name of this file is robots.txt and it’s located in the “root,” so you can see it if you type www.website.com/robots.txt into your address bar. It’s public so you can look at the robots file for any website. This is the most important thing: if you put NOINDEX in your robots file to keep the search engines out while you were developing the site, remove the noindex tag before you go live. If you fail to do this, you will destroy all of your search engine rankings. Need some help? Here’s a robots.txt generator that will do the work for you. This is different from the sitemap that visitors see on the website. It’s a special file that shows search engines where all the pages are on the site. Like the Robots file, it’s in the “root” so you can see it for your site (or any site) at www.website.com/sitemap.xml. For most sites, this file is created automatically by the content management system. Take a look at yours and make sure that every URL from your prioritized list is there. If all else fails and a redirect was missed, the visitor will land on a “page not found” page, also known as a 404 page. Take a minute to make sure that your 404 page is more than just a dead end. 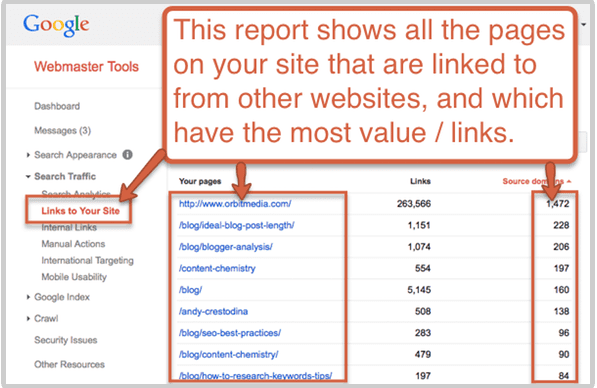 Add links to your most compelling articles or most popular pages. ProTip! A lot of websites have unnecessary dead ends. Here’s a post on how to find and fix the dead ends on your website and keep the visitors flowing. Your 404 page is also a chance to have a little fun. By now you shouldn’t be nervous at all. You should be excited to launch the new site! You know which pages are ranking and attracting traffic and how valuable that traffic is. You know which pages have authority. You’ve created new, improved corresponding pages on the new site and carefully set up your redirects. Still a bit scared? Feel the fear and launch anyway. Now that the new site is live, there are a few steps to take to make sure everything is running smoothly. In the hours and days after you go live, keep an eye on the “Real Time” report in Analytics. Although really isn’t all that useful for analysis, it’s a quick way to see if anything big is going wrong. Is Analytics setup properly? Is traffic down significantly? Are lots of people hitting your 404 page? The Real Time report is the fastest way to if there are major issues and react. If nothing else, you’ll see right away if there is a problem in your Analytics setup. Post launch, real data and reports come to life in Google Search Console. First, you can “Fetch as Google” to tell GoogleBot to come visit, but this really isn’t necessary. Google will likely crawl your site within a day. Here are the basic diagnostics you can run post-launch from within Search Console. Run your robots file through the robots.txt tester. 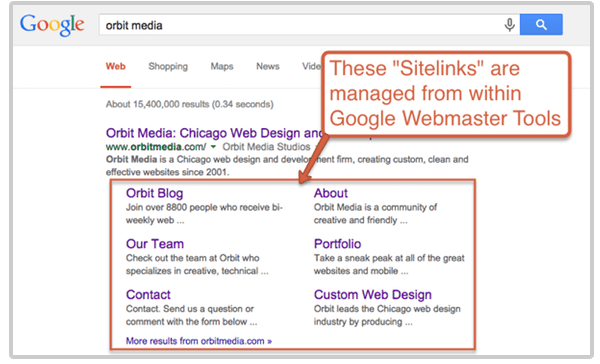 Manage your “sitelinks.” Since these are based on URLs, they may have changed during the launch process. Make sure to “demote” any URLs that you don’t want to appear in Google search results when people search for your brand name. Eventually, it will just show the ones you like. Congrats on your Relaunch! ….did you lose traffic? Don’t panic. A slight reduction in organic traffic is common. It’s also potentially meaningless. What matters isn’t how much traffic you get before and after the launch, but the quality of that traffic. Did the drop in traffic correspond to a drop in leads? 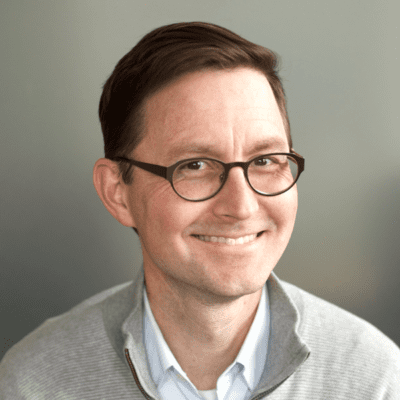 This little Analytics gem comes from our friend at Conversion Sciences, Brian Massey. It’s a clever way to use your 404 page to find which links from other websites to your website broke during the relaunching process. Once you’re done, the Behavior > Site Content > All Pages report will starting showing “not_found_404,” which you can search for with a filter. Each time this page appears, it shows where the visitor came from. If they came from another site, you just found an opportunity to contact that site and suggest that they fix the broken link by linking to an actual page on your site. If the “from” is empty, that means they didn’t come from another site. They found there way to your 404 page from your own site, suggesting an error and an opportunity to create a new page on your site. Have you ever noticed that every bit of advice that Google gives sound suspiciously similar: give your visitors a great experience. Make your site better. Provide useful information that loads fast, works on mobile and makes visitors happy. That’s what website redesign is all about. So fearlessly relaunch your site! And if you know anyone going through a redesign (or hesitant to launch because of high rankings) feel free to pass this along. All I have to say, besides complimenting your content as always, is that whoever chose the featured image for this article is genius! That’s actually a little “doomsday device” that makes an explosion sound. You used to be able to buy them on ThinkGeek. We press that button whenever we launch websites. It looks like one of the designers just took a quick picture of it and used it as the image here. Fun, right? I’m glad you liked it, Elijah! As usual, thank you for sharing the details, examples, and steps in your typical, thorough way. The annotated screen shots really help a lot! I’ve gotten so I’m adding screenshots to everything. I use “Jing” which makes it really easy. But I’ve heard that “Sketch” is even easier. Either way, they take seconds to make and people really seem to like them! Thanks, as always, for the comment Roger. Great points you’ve laid out here. Another tool I would recommend as an alternative to Semrush is Serpstat. Pretty awesome tool with keyword analysis and competitor analysis features. Just two words that sums this post up. Simply amazing! Great post Andy. I had no idea that redirects in .htaccess hindered the speed of a website. Great tips here! Brilliant – thanks so much for this fantastic guide. I have had experience relaunching massive sites, 200,000+ page views a day etc. General wisdom is if site is based on rock solid foundations, it is likely to sustain the changes you are going to make. I believe relaunch should be done in stages, first change the design, don’t play with content or url structure much, once design is changed, start changing site architecture in stages, e.g try changing certain low traffic category first and see how it responds in search results. If there are not too many changes in the content, and if site has now a better architecture it is likely to increase in traffic. Thanks Andy; I’m going through this now and it’s been invaluable! I can’t thank you enough for doing this. I have stuck with a very old and clunky website done in Frontpage because of the great ranking. I could no longer do it and am in the process of developing a new one. I was willing to just start fresh but now I have tools to help. Great great great piece of information. I really found this article very helpful. This gives a perfect step by step guide for the site revamp. For the 301 Strategy – it was always a huge problem to figure out which url was lost, what has changed and where to redirect, also with all the tools mentioned above it is a whole lot of work for bigger pages.